We have already written an article on what words and phrases a contact centre advisor should never say, but how about specific situations – like dealing with an angry customer? It is important for customer retention, but even more so for advisor morale, to know how to calm, reassure and support an angry customer. However, this process can never start if you repeat language and statements that will spur the irate customer on. So, here is a list of phrases sent in by our readers which you must never use when speaking to an angry customer on the phone. These have been ordered into seven fundamental categories, which you must be aware of! Never undermine the integrity of the customer, because, being already angry, they will be more likely to take offence. With that in mind, make sure your advisors do not say any of the following. This phrase sounds very patronising, so if an advisor has to repeat themselves, it is important to avoid this kind of “bolt-on” phrase, so you are not fighting fire with fire. What is obvious to you, as an advisor, may not be obvious to a customer who has little knowledge of the industry. So don’t irritate a customer by using this phrase to sound superior, just try to present them with solutions. On the face of it, this does not seem antagonistic, but feigning an understanding of something that may run deeper than a telephone outburst could be resented. Instead, advisors could use a list of carefully prepared empathy statements to create genuine rapport. Using negative terminology will only infuriate the customer further, so make sure you replace the following with positive words and phrases and provide answers. This implies that it is the customer who is in the wrong, and whilst that may be the case, the customer certainly does not want to hear it. This statement would cause the customer to feel isolated, which would only spur them on, and passing them through to a colleague will only foster more frustration. So, encourage advisors to get creative and look for innovative solutions. It is likely that the customer is angry because they feel undervalued and belittled by your company, so advisors must be prepared, as company representatives, to avoid making threats and orders, to go against this interpretation. Using the following statements will only demean customers further. An angry customer may just be calling to vent, so by making threats you could end up making the situation worse. The longer that advisors stay on the line with an irate customer, the more appreciative your company seems of the caller’s business. As the caller is probably angry because they feel powerless over their situation, giving them an order and telling them to calm down may just provoke more anger if you do not provide any reassurance with it. Never leave an angry customer on hold without giving them a strong idea of what is happening, as the pause will likely cause their frustration to build further. Never tell an angry customer that it is they who are in the wrong, as, obviously, this will only increase bad feeling. Also, advisors must never blame colleagues, as this will reflect badly on the brand. So, avoid saying the following. Although this may be true, customers won’t be interested in which department represents what, they just want an immediate answer. So, take it upon yourself to handle the matter and try to get the customer to agree on a realistic time limit. Make sure advisors focus on presenting solutions and cut out whatever is in between; advisors should not feel the need to justify themselves. So, work to try and find a mutual solution and avoid insinuating blame. This again goes back to the principle of always offering solutions and diverting from negatives, as reflecting back on the source of anger will only enhance customer dissatisfaction. So, be careful to avoid excuses like those below. Anger in the contact centre often forms from a product/service not meeting a customer’s expectations. In the mind of the customer, company policy should not overrule basic expectations. Therefore, advisors must stop using this phrase and tell the customer what they can do to go the extra mile. Using such a statement will instantly make the caller believe that the advisor is out of their depth, causing the customer to feel stranded in their given scenario. This will only increase customer frustration and incite anger. The quotation above reminds us of the importance of patience when it comes to the role of an agent. So, avoid cutting off and hurrying an angry customer. Advisors can do this by eliminating the following statements from their interactions. Advisors should always be confident to handle all call types, because, when a supervisor is called, the customer will only view the original advisor as a mere gatekeeper to getting their answer. So, in effect, the advisor has acted like a prolonged pause, which will continue to rile the customer. Telling the caller that they are being recorded may cause them to feel as though their privacy has not been respected and may irritate them further. This can negatively affect their loyalty. Apologies are often linked to demonstrations of empathy. However, in the case of the apologies below, they do not create connections but further incite negative emotion. Apologies in the customer service arena tend to sound insincere. So, avoiding statements such as the one above and those below can remove the “falseness” that may upset customers further. So, we have presented our list of phrases to avoid using around angry customers, but what can you possibly replace them with? 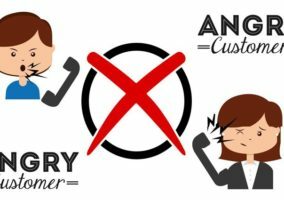 Here, we have an article that provides you with all The Right Words and Phrases to Say to an Angry Customer. Are there any other phrases that you would have added to our list? Please leave your responses and thoughts in an email to Call Centre Helper. Thanks to the following for sending in their examples of phrases never to say to angry customer, which have been used in this article: Bill O’Reilly, Dave Salisbury, Nick Abbott, Carolyn Blunt, Roy Holmes, Tessa Pearce, Jerry Johnston, Shanavas Puthiya Purayil, Don McLean, Emil Ivan, Joanne Shepherd, Jerwin Oliver, Snitha Bains, Dave Reeves, Kemi Federlein, Sandra Crighton, Adi Hassan, Gary Donnison, Conrad Edwards, Chez Stevenson, Andy Evans, Kristen Furniss, James Wilson, Shannon Dziepak, Tara Aldridge and Taj Shaikh. I disagree wholeheartedly with the idea that someone should stay on the line indefinitely with an abusive or rude customer. Contact Centre employees are human too, and this can be really detrimental to their physical and mental wellbeing. It’s about time that we as an industry say “enough is enough. 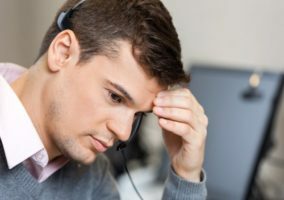 If you’re calling a contact centre just to vent and be abusive, then you’re not welcome.” – and actually side with their employees, instead of forcing them to suffer mentally for sake of “customer service”. Not many other business sectors would allow their staff to stuff this. You’d see a customer thrown out of a restaurant or shop for treating the staff like some people treat contact centre advisers. I agree with the other suggestions though. I agree with your point D, however there is a good way and a poor way to handle angry customers and if you can diffuse the situation by choosing your words more carefully rather than making things worse, it can be a really positive experience for the customer AND the advisor. Why not? What do you think I’m going to do to you? What are you going to do to ME that’s going to make me want to hunt you down? It’s just another way to antagonize an already frustrated customer and let’s face it, we’ve all had experience of calling a contact centre and most of us EXPECT poor service these days. Glen is right. Even though I still stand with Elena when it comes to comfortably handling the situation. My opinion is that you can’t cross negative energy with a negative energy. You gotta use positive energy to neutralize the situation in its entirety. Just my opinion. Moreover keeping my calm even when customer is yelling keeps my life simple as an agent.